So, I got three parking tickets in the last few weeks. 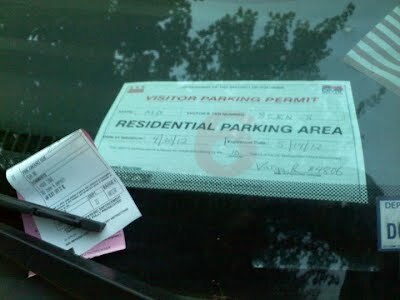 I feel 1) like a total idiot for not paying attention to the warning ticket I received weeks ago and researching temporary parking permits in DC, 2) vindicated because the meter maid gave me a ticket for parking in a residential parking zone while I had a prominently displayed temporary residential parking permit (see above photo), 3) like a total idiot for not paying attention to the street sweeping signs when parking the night before street sweeping. 1) Don’t be an idiot. Pay attention to the street signs, even when you are super tired and just want to flop into bed and could care less about where you leave your car. Also, don’t think you can get away with parking in an illegal spot either because the meter maid will come that day, even if other cars always park in front of that fire hydrant and they never get ticketed. The one day you are too close to the stop sign is the day that the meter maid will get you. Yep. Then you’ll be cursing loudly at 8am while a woman walks by with her toddler on the way to kindergarden. Very classy. Also, don’t be a jerk and double park, block in someone’s driveway, or park in the handicapped spot. Tisk Tisk. You should know better. Karma also comes around. Just like the meter maid. 2) Know the rules. If you just moved somewhere, learn the rules for parking on the city streets, even if you only plan to live there temporarily. Don’t assume that you know them, look them up. The internet can teach you many things. Case in point: I got a warning ticket for not registering my car in DC and I paid it no mind. I assumed that it meant that I needed to get a visitor parking permit, which I did. Nope. I needed to register my car in DC since I will be living here more than 30 days. If I had researched this thoroughly before I moved I would have learned a work around which would have allowed me to register my car as a frequent out of state visitor (cost: $0). Instead, I didn’t look up the rules, didn’t read the warning carefully, and ended up with a ticket (cost: $100) and having to register my car temporarily in DC (cost $285). Hence, being ignorant is more expensive than being informed. 3) Fight the power. If you get a parking ticket that was issued in error, like the residential parking ticket I got while I had a valid residential parking permit, fight it. Seriously. It only takes a few minutes of your time to write a letter, enclose a picture and save yourself some moolah. DC even allows you to submit your ticket ajudication online and you can even attach photos to it. Super easy. I assume that they will contact me soon and let me know that they are forgiving my ticket but, just in case, I am keeping the ticket, a copy of the text I submitted online, and pictures. I have successfully fought other tickets due to over-excited meter maids who fail to pay attention to permits and improperly posted signs. If you don’t deserve the ticket, don’t pay it. Save your dignity and some money and fight the man. It will pay off. Also, if you did deserve the ticket, pay it. Otherwise it doubles. And let it be a lesson to you to pay closer attention next time. UPDATE: I got a postcard in the mail three months later that said that the DC DMV reviewed my ticket ajudication and is dropping the ticket. I won!!!! Previous Post It’s Free Slurpee Day at 7-11!!! Next Post Look What Came In The Mail!